US Ambassador to India, Rahul Richard Verma met Uttar Pradesh Chief Minister Akhilesh Yadav and held a discussion on developing Allahabad as a smart city. Soon after the meeting, Rahul said that America wants to expand its economic and trade relationship with India. The meet was on those lines. 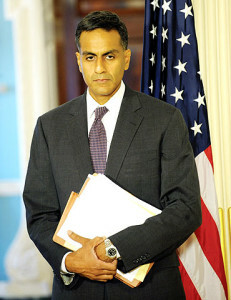 He further expressed that US is willing to build up and increase the bilateral ties with India, especially with UP. In addition to it, he said that US entrepreneurs were interested in investing in the State and asked about the sectors that were suitable for investment. They are also showing enthusiasm towards assisting India in the education sector. Meanwhile, the UP CM has deliberated that there were a number of possibilities in the State. The Government has implemented pro-investment policies under which a lot of facilities were available for the entrepreneurs. He offered the options of various sectors like agriculture, agro-processing, infrastructure development and waste management, etc. Further, he has assured the US Ambassador of all the help and support from the State.